A great cover can be a major factor in persuading book shops to stock your self-published book, and then getting the reader to access the pages inside. If your book cover has even a hint of the amateur about it, bookshops won't stock it, and potential readers may not get as far as picking up your book - let alone seeing the content or handing over their cash. When it's published your book will be in the market place competing for space in a bookshop, whether that's bricks-and-mortar or online. Your book's cover needs to attract, inform and sell. 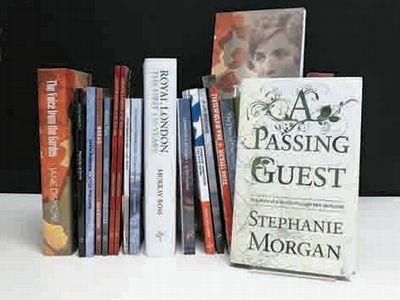 A printed book will generally spend most of its shelf life spine-out, so the look of the spine is just as important as the look of the cover. The spine should reflect the style and overall design of the cover, whilst maintaining a simplicity that means the title and author name is legible, and the publisher's logo is clearly visible. It's also vital to get the choice of typeface, and the colour and size of the type right, so that the book is easy to find on the shelf as well as aesthetically pleasing. And if it's available as an ebook, the cover must work well at thumbnail size. It's said that a reader makes a judgement on a book in just 8 seconds, and in that short blip of time they decide three things about a book - "Who is it by? ", "Have I already read it? ", "Is it my sort of book?". This means the front cover of your book needs to be visually captivating and must also convey essential information: author, title and genre. So, use an impressive image or graphic to grab the attention of the reader. Make sure your cover image is strong enough to see across a room but also works well as a thumbnail on the internet. The use of simple, strong colours will make an impact but make sure they don't jar or detract from the text. As with the spine, the choice of typography should complement the design but also make it clear to the reader who the author is, and the title of the book. If the text is too small, in an over-elaborate font or positioned in an unusual way, people could find it too difficult to read and be dissuaded from buying it - counter-productive when your primary objective to get them clutching the book in one hand and heading for the tills! A secondary function of the typography is to establish a consistent 'author brand' that the reader can recognise in an instant. An author brand carries a subliminal guarantee of quality, and sets the target reader thinking "I know that author's work... I've read it before and I liked it..." The reader has a relationship with that author, and they know what they're going to get when they buy one of their books. Once you've devised and developed your author brand, roll it out consistently across your author activities (on your blog, on your website, on all your promotional tools) so that your target reader gets used to seeing it and associating it with you and your writing. The cover design should reflect the genre of the book, offering the potential readers subtle clues about whether this is their sort of book. By relating the design to the genre visually, the target reader is automatically drawn to the book. Study other books in the same genre as your writing and go for a similar look and feel for your cover design. If you write chick-lit, choose a curly cursive font and a pastel-tinted illustration. If you write travel books, select images that show modes of transport, pictures of destinations or perhaps just the idea of movement. The book covers of crime novels tend towards red and black. These may sound like stereotypes, but stereotypes can be good - they're a shorthand for the potential reader (and remember they're making their mind up in just 8 seconds... so it's vital your book communicates quickly and effectively). SilverWood's cover designers are all qualified degree-level graphic designers who draw on long experience of design for a range of applications. Designing a good book cover is about more than simply knowing how to use software. Training and expertise are vital, as are knowing what works within the current marketplace, having a deep knowledge of typography, the ability to communicate ideas and information with clarity, an understanding of proportions and contrast, and the know-how to select and combine the right illustration, photography and typographic elements in perfect balance. It's not essential for a professional designer to produce your book cover, but working with one makes it far more likely that your book will be seen as professional within the highly competitive books marketplace. If you'd like to discuss bespoke and market-appropriate book cover design for your next project, please contact the Publishing Team.